It may not be as technologically advanced as its biggest competitor, but it is incredibly simple to control, and doesn't require a smartphone. It battles with the wind, and wins and is capable of supporting existing GoPro Hero cameras. To say that GoPro's first effort at launching a quadcopter was turbulent would be something of an understatement. Initially it seemed an impressive, affordable machine - until DJI announced the smaller, more technologically advanced Mavic Pro. Then, to top it off, before the Karma even reached European shores, it had to be recalled due to a serious battery design problem which saw some fall from the skies over in the USA. Three months on and the Karma is fixed up, back on sale, and looking sharp for 2017. 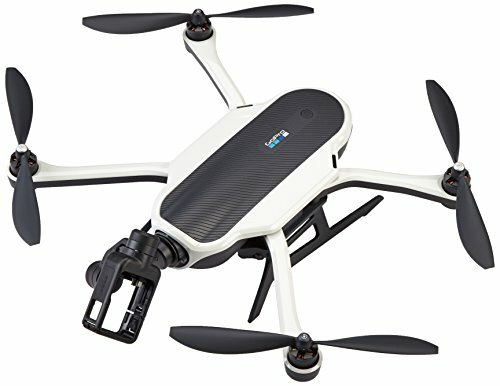 GoPro isn't pitching it as a competitor to the Mavic either; rather, this drone is a flying accessory for those already in the GoPro ecosystem. And for those, it might just be the very best accessory going. The GoPro Karma has been designed with simplicity and portability at its core. It has a white, black and dark grey colour scheme with a small GoPro logo on the top of its main body next to the power button. As far as drones go, it's all rather good looking. Four arms extend from the main body of the Karma, each of which has a 10-inch propeller on top. These have been positioned to ensure they aren't within the camera's view. The front two arms have green lights underneath, while the rear two arms have red lights, enabling you to see which way is forward when it comes to controlling it - something that comes in handy. On the underside of the main body are four legs to keep the Karma steady, along with a battery that slides out (and is charged by using a proprietary cable). The front has a circular hole, allowing for the attachment of the camera and stabilisation mount. This is easily detachable with a twist and lock system, enabling you to then attach it to the Karma grip for using on the ground as a handheld gimbal system. The Karma is compatible with Hero 4 and Hero 5 action cameras. The Karma can also fold up in order to fit into the special backpack, which is where the portability comes in. This included backpack holds the drone, along with the clamshell remote, charging equipment and stabilising mount and the grip - all of which fit perfectly into their designated spots. GoPro claims the backpack has been designed to allow you to take Karma with you anywhere, on any activity. The backpack offers a nice design and although it's not super light, it's not exactly heavy either. The Karma drone weighs a tiny bit over 1kg, while the remote is 625g - so you're probably looking at a little over 2.5kgs altogether for everything you need to get Karma in the air. The added cushioning and air grooves ensure that it remains as cool as possible when being worn, so that even if you're hiking up a mountain on a hot day, it'll be no more uncomfortable than a regular backpack. There's also a built-in shoulder mount for the Karma grip, so you can hook the camera onto the bag strap while walking to your flying location. The clamshell remote for Karma is one of our favourite things - because it's so simple to use. Open the clam and you'll see a built-in 5-inch touchscreen that enables you to see what the Karma can see. Compared to its most well-known competitor, the Mavic, this is far more convenient. You don't need to plug in your phone or any other device to get a live feed from the GoPro's camera (whether a Hero 5 is included will depend on the package you buy, so keep that within budget mind). Under the screen there are two joysticks for controlling the Karma: the left is for altitude, of which the maximum is 4500-metres; the right is for steering. Push the left joystick up and the Karma goes higher, push it down and it drops lower. The same applies for steering: push the right joystick left and the drone moves left, push it up and the drone moves forward, push right and it moves right, while pushing down moves it backwards. You get the drift. It's very simple and very easy to use, almost like playing an old skool racing game. Just below in the centre of the joysticks is the power button. To get Karma to take-off, you need to press-and-hold the start/stop button for three seconds, then tap "auto take off" on the screen. This avoids accidental take-off for safety. Landing is a piece of cake too, with one button needing a tap, situated below the power button. On the outside of the clam are two final buttons and a scroll-wheel. The two buttons are situated on the back of the controller, just about where your right index finger reaches. One button is used to capture photo or video, the other changes camera modes, or puts a marker in a video's timeline to make it easier to find a specific part of the footage when it comes to the edit. As if the controller wasn't already great for beginners, there's a built-in simulator to help you get to grips with what all the buttons and joysticks do, without the drone leaving the ground. For those nervous about taking-off for the first time, this takes a heap of pressure off. Instead of taking the drone off the ground, you get basic 3D graphics on the 5-inch screen showing a small, simulated drone in a texture-free landscape. To begin with, the simulation runs you through a tutorial, showing you what each of the controls is for, then you fly the computer generated quadcopter around the virtual world. Another cool controller-based feature is the ability to download maps when you connect to a wireless network. The GoPro Karma has four preset flight patterns. Reveal flies to a chosen location and pivots the camera upwards as it does so to reveal the scenery. Cable Cam flies backwards and forwards between two chosen points, at a speed you have set. This is useful if you want to have it follow someone walking, running or cycling and want to match their pace, for instance. The two other automatic modes are Dronie, which results in zoom selfies; and Orbit, which makes Karma continually circle around a subject. You can of course just control Karma freely too. If the battery starts to run low, the Karma will give you three warnings. It will start returning to you on the second warning, unless you choose to override it, while the third sees Karma begin to descend and land. The Karma will know if the remote has moved location, however, so if you're filming on a moving boat, for example, it will know not to land where it took off (as that's likely to be water, which wouldn't be ideal). While these feature are all wonderful and work really well, we've flown some more advanced drones and, therefore, feel there are a couple of noticeable features missing. Firstly, there's no automatic tracking feature, so you can't tell the drone to lock onto a subject and follow it around. GoPro is working on this, and will hopefully include this capability in a future update, or upgraded product. Secondly, there are no obstacle avoidance sensors anywhere to be seen, so it's up to you to avoid lamp posts or trees. If you're flying in a wide open space (as you should be), this isn't such a big problem. If, however, you're flying near trees, or you've flown the drone quite far and don't have a clear view of any potential obstacles, you need to pay much more attention. There is one neat feature, though, which is a built-in GPS system that refuses to let the Karma fly in no-fly areas, such as airports. That's some responsible droning, right there. We've tested the GoPro Karma in a number of locations. Once on the top of a mountain, which by all accounts was very windy. We aren't talking mess-your-hair-up wind, we are talking tables-almost-blowing-over wind. Despite us being blown all over the place, the Karma appeared to be oblivious to the gusts thanks to its maximum wind-resistance of 22mph. The footage from our test flight demonstrated just how good the image stabilisation is, with the only evidence of the wind being the howling audio rather than a shaky video. It really is impressive. Controlling the Karma was unbelievably simple to the point where if you had never flown a drone before, you probably wouldn't have any issues piloting this one. For some, it might be too simple, but we love it. The joysticks feel great, offering great traction, and there's very little lag between moving them and the Karma moving in the direction we commanded. We didn't push it anywhere close to its 10,500ft maximum altitude, but it had no trouble being at relatively high altitudes in Snowdonia or Lake Tahoe mountain ranges. Battery life was about as good as we were expecting, too. It got close to its 20-minutes of flying time, averaging between 15-19 minutes of flight per full charge. It may not be as technologically advanced as its biggest competitor, the Mavic Pro, but the GoPro Karma is incredibly simple to control, and doesn't require a smartphone. It battles with the wind and wins, plus it's capable of supporting existing GoPro Hero 5 and Hero 4 cameras. The price of entry for this system varies depending on whether or not you already have said action camera, or the Karma Grip handheld gimbal system. For instance, £569 gets you the Karma drone but no Grip or camera, while £869 gets you the drone and the Karma Grip, but no camera. For the whole kit, including the Hero 5 and the Karma Grip, you're looking at spending £1,199. Is it worth it? We think the GoPro Karma is heaps of fun and super easy to control, making it one of the more accessible and capable drones on the market. And it's good to see those initial launch issues are now behind it. If you want obstacle avoidance then the Mavic Pro is the one to go for. You'll need a phone to beef up the included remote control and it might notbe as consumer friendly as the GoPro, but it's the more advanced device overall.